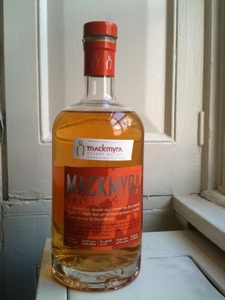 Mackmyra (mak-MEE-ra) is one of the most exciting new distilleries in the explosive World Whiskies segment. After an initial small pilot program started in 1999, serious investment and a serious distillery operation and village was built starting in 2002. Cool details abound, such as cave aging in an old mine. Unique local Swedish materials such as cloudberry and Swedish oak are used in building new and unique flavor profiles. Practically every trick in the crafty craft distiller's book is used: including the use of small barrels with short maturation times, virgin oak used in some barrels, creative finishing and mixing and no age statement young releases. The careful barrel management bears fruit as the components are assembled by the innovative iconoclastic palate of lovely master distiller & master blender Angela D'Orazio. Some of the fancy barrel management is apparent right on the The First's label which boasts 5.4% Swedish Oak, 45% small casks, a hefty 46.1% bottling proof, and Bodas Mine aging. Of course it's organic, without artificial colors and no chill filtering. At the moment The First is the only expression available in the USA. Their web site shows many others - most only available in Scandinavia and quite rare even there. Given all this you might expect potent flavors and clear statement of the flavor signature - but that's not the case. I first tasted The First about a year ago. I had gone into Park Avenue Liquor to pick up something old and Scottish and unexpectedly met with a tall and striking Swedish blonde looking to pour me an exciting new single malt I had never heard of. The whisky didn't immediately grab me. Freshly poured, undiluted, in a tiny plastic thimble cup the whisky was a bit flinty and tart, with a light body and a bit of young rawness. There were some nice flavors and some lovely refinement on the finish but I smiled and left without picking up a bottle. I felt that it was a brand to watch out for, but not something to get now. As the months passed, however, and excitement built and good reviews appeared in the press, blogosphere, and informally among friends I began to get the feeling I missed something. I ordered it at one of the few bars serving it around here and had a magnificent experience. 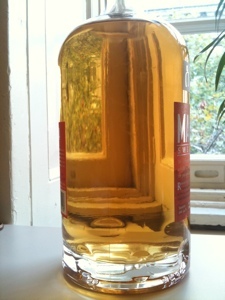 It was clear that Mackmyra's The First had hidden depths but needed air, time, and a drop of water to reveal itself. Like a fan dancer - you miss out if you rush and leave too soon. Color: Pale gold ("Chardonnay") w/ pale yellow-green Peridot glints. Nose: Fresh grassy honey heather aromas lead. A young, slightly raw edge fades with time. A slightly acidic fruity note with aspects of green table grapes or gooseberry fights with lusher honeysuckle florals and honeydew melon - reminiscent of a Speyside malt. The tension between acidic and floral fruits holds a special quality that reads conifer to me. Deceptively light and simple at first, but with depths to explore. On entry there is a dusty chalky aspect to the sweet and floral. Then the acidic, almost minerally white wine quality interacts. There are mineral and conifer notes swirling with floral and grassy sweet. The finish is surprisingly long and tart with a tannic acid quality and a lingering expansion of the conifer-like herbal quality that grows and iterates as the alcohol burn fades into an elaborate filigreed finish of anise and ivy herbs. This is one of the few drams in my experience where the finish is as vividly flavored as the mid-palate (indeed, in the first minute or two of afterglow maybe more so). A few drops of water transforms this dram. The nose takes on a lush and honeyed quality. The mineral and tart now gives the sense of a noble tempering of the august floral fruity sweet. The mouth feel has become noticeably thicker and in the richness I get lactones, tart, mineral and sweet that meld to a distinct Brie cheese with berry - maybe lingonberry. Yum. The finish had the bitter of Brie cheese rind and hints of citrus peel and echoes of distant pine smoke amid the anise and ivy herbs. Just wonderful. With extended time the floral aspect becomes marked and the whole presentation takes on an aching beauty skirting the line between dry and off-dry, floral, mineral, fruity acidic grape, youthful freshness, and finesse. This is $50-$55 for a liter? This is an overachieving dram for the price. 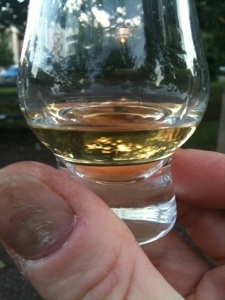 But it is slow to bloom: a delicate and subtle dram. You must stop and listen, like a deer in the forest, to catch the rich tapestry that the youthful Mackmyra The First weaves. Go too fast and you'll miss it. That makes it unsuitable for some. What it clearly does for me is flat out become my new whisky crush. 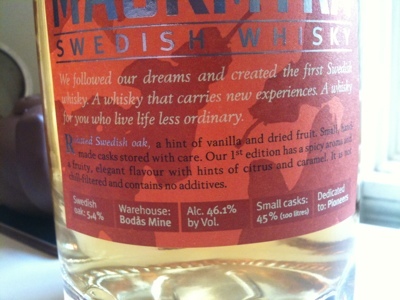 It also lays down the gauntlet firmly announcing that Mackmyra is a coming force to be reckoned with and the concept of "Swedish Whisky" is no joke. How I feel drinking Mackmyra The First. 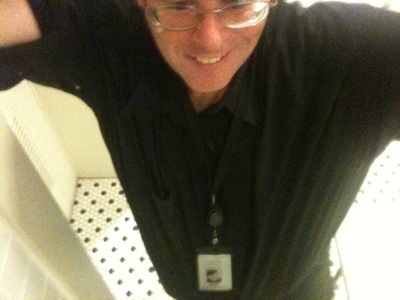 I especially love the photo of your excited self! hahahaha - great way to end a lovely review. Ha! Thanks so much, Allison. I really appreciate you're help turn me on to Mackmyra! "Swedish Whisky", who knew! Sounds very intriguing and like there's a lot going on, complex. It's an exciting time in the world of whisk(e)y for sure. with avidity. I was particularly taken with your review of revelatory Queen Jennie Sorghum Whiskey. Bravo. 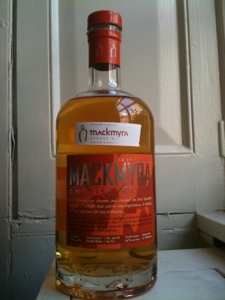 Yes, Mackmyra is still obscure in many parts. Hopefully that will not continue to be the case for long. Thanks Josh! You have a way with words as always. I thoroughly enjoy The Coopered Tot as well. Cheers!